Craft and toddlers go together like Labradors and mud puddles: it makes them so happy but the aftermath can be traumatising for you, their owner. So begins the addictive cycle of beautiful messy expression and the bittersweet hereafter. Here are the seven stages of crafting for a parent. What to do today? I know, craft!! Just the mention of the word “craft” and the sight of the paints coming out of the cupboard makes your toddler squeal with excitement. And who doesn’t love a happy toddler? You congratulate yourself for being “Mum of The Year” and start laying out the butcher’s paper, the glitter, the glue, the paints. This is going to be the best morning ever. With the table laid out beautifully, you let your toddler loose. She goes straight to the glitter and, instead of the Pinterest-y sprinkling of fairy dust you had in mind, she upends the entire glitter vial onto the table and starts swirling her hands through it with a look of dreamy pleasure on her face. That done, she grabs the black paint and yells, “I do it! I do it!” while squirting a giant globule onto the fresh sheet of paper you had intended for a sweet stick figure portrait. Then for the finale? Both hands into the black paint and more dreamy swirling. Not quite what you had in mind, but she’s so happy. You let her continue with her Jackson Pollock-style tribute and congratulate yourself for having encouraged such a creative free spirit. With five fresh sheets of paper now covered in glitter and black paint, you begin to try to direct your toddler toward another colour and perhaps a method that involves a paint brush. “Let’s paint a picture of Mummy,” you say, attempting to push her into a more figurative style. “I do it! I do it!” she cries, finally emptying the tube of black paint so that there is no more. Then she cries because all the black paint is gone. You try to convince her that primary colours are nice too, but it’s no good. She’s in a deep mourning for the end of her Goth period. You wonder why you even attempted this madness called being a crafty mum. What were you thinking? At that point your toddler stops crying because she’s just realised there’s more black paint … on her hands. She turns to the walls and makes two perfectly formed black handprints on your white dining room walls. Time to get this circus under control. You snap into action – grab your toddler by her wrists, strip her down and take her outside to wash her clean. You tell her to hold out her hands and you turn the hose on her. SHE LOVES IT!! Now she’s giggling with delight and it’s the best morning ever. Then as you are towelling her down something magical thing happens – she yawns. Then, a miracle! You put her down for her nap and she goes straight to sleep. With the house quiet, you survey the morning’s creative aftermath. Handprints on the wall, glitter on the floor, five sheets of paper covered in black swirly fingermarks. But the silence! Oh, the silence. You grab a cloth and start on the clean up. To your surprise, the handprints on the wall are not indelible and they come off with a few swipes of your clever wipe. You rinse it out in cold water, and you’re ready to tackle the glitter and glue. The disaster is swiftly eradicated. 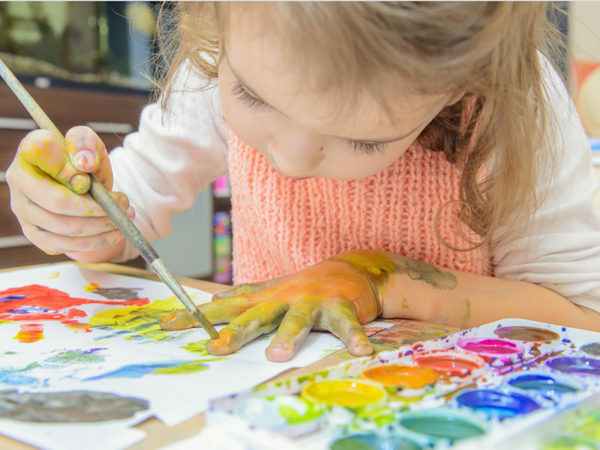 Only the good bits of the morning remain – your giggling toddler, the look of dreamy wonder on her face as she swirled her hands through glitter and paint, the squeals of delight when you hosed her down. Not such a bad morning, after all. Clean up done, and miracle of miracles, your toddler is still asleep. You have enough time for a cup of tea and 30 precious minutes to yourself. Like a goldfish, you forget all the trauma and think about what you’ll put out on the crafting table tomorrow. Maybe it’s time to up the ante with some multimedia collage or egg carton craft. Dream big, Crafty Mama. Dream big.